The Cambridge Assessment English has plans to spread its wings to the tier II and III cities, with an aim of offering English language training to teachers in educational institutions, improving communication skills of students, conducting examinations and awarding certificates, according to Key Account Manager, South Asia, Kevin Coyne. Students in the tier II and III cities in India are eager to excel and desire to top in various competitions and exams which is fascinating, he said at an interaction programme here on Thursday. 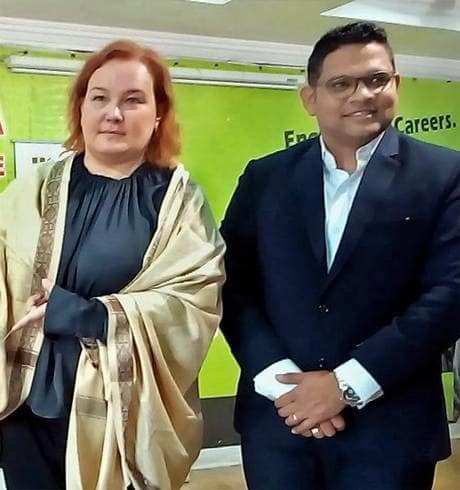 Mr. Kevin Coyne and Country Manager, Russia, of Cambridge Assessment English Elena Markova were all praise for the attention paid to languages in the curriculum and otherwise in India. I am surprised at the attention being paid to English in India when compared to Russia where we are conservative and reserved and think that to know Russian is enough. In spite of presence of several languages there, students and teachers give lot of importance to English and teachers training, Ms. Markova said. There are various examinations of Cambridge Assessment English right from the young learners at the school level, general and higher education and business, the last in three categories—preliminary, vantage and higher, she added. As a part of its focus on such cities, Cambridge English Examination Centre was launched at Sanketika Vidya Parishad College of Engineering, Visakhapatnam, with the participation of SVPCE Secretary S. Rajendra. It is the second such educational institution to be set up in Andhra Pradesh, after the Vignan, where the examination centre has been opened. The classes ranging from 40 to 60 hours are conducted for students by teachers who are given orientation by Cambridge Assessment English. Mr. Coyne said other institutions also could derive benefits from the centre. To improve English teaching in engineering colleges, Faculty Development Programme, a joint initiative of the AICTE and Cambridge Assessment English, was launched recently and offered to institutions on an all-India level, Mr. Coyne said. After screening the applications received, 30 have been shortlisted for participation and Cambridge English Teaching Knowledge Test certification have been issued, he added.